Defense attorneys for Jason Van Dyke rested their case Wednesday, one day after the Chicago police officer who fatally shot Laquan McDonald took the stand in his own murder trial. Within seconds of court starting, the defense rested and prosecutors began calling rebuttal witnesses. Minutes later, both prosecution and defense rebuttal testimony ended. Closing arguments are set to begin Thursday. 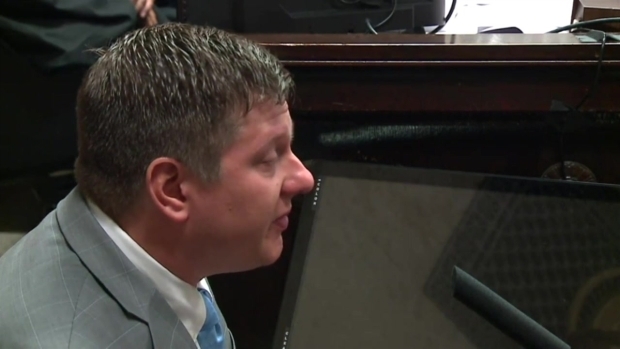 Chicago police officer Jason Van Dyke, the man accused of killing Laquan McDonald, took the stand Tuesday in hopes of solidifying his innocence to the jury. NBC 5's Charlie Wojciechowski reports. In the nearly three weeks of trial so far, the defense has called more than 17 witnesses, including Van Dyke himself, as they argue McDonald, a black teenager armed with a knife, posed a threat when Van Dyke, a white officer, opened fire on him. Van Dyke was charged with first-degree murder more than a year after he shot McDonald on the city's Southwest Side. He entered a plea of not guilty. 10:15 a.m.: Following tomorrow’s closing arguments, the jury will receive their instructions and then begin deliberating the fate of Jason Van Dyke. 10:11a.m. : Prosecution and Defense complete rebuttal witness testimony in Jason Van Dyke trial. Closing arguments scheduled for tomorrow morning. 10:09 a.m.: During cross examination, defense attorney Dan Herbert points out that its the policy for Cook County sheriff’s to render aid. But Murphy did not that evening. Herbert then pointed out that its CPD’s policy not to render CPR to victims because they are not trained medical personnel. 10:06 a.m: First rebuttal witness called is Adam Murphy, a Cook County Police Officer who testified back on Sept 18th that heard Laquan McDonald’s last gasp of air. He’s now back on the stand, testifying about the amount of blood he saw on the ground that night.